At Petrotech, we provide a range of applications for turbomachinery and other rotating and plant control systems. Our products include control systems for gas, hydro, expander, and steam turbines, generators, reciprocating and centrifugal compressors, pumps, and all ancillary systems. We work with our customers from engineering and design to startup, training, and aftermarket support to deliver a full turnkey service. Explore our control system applications. 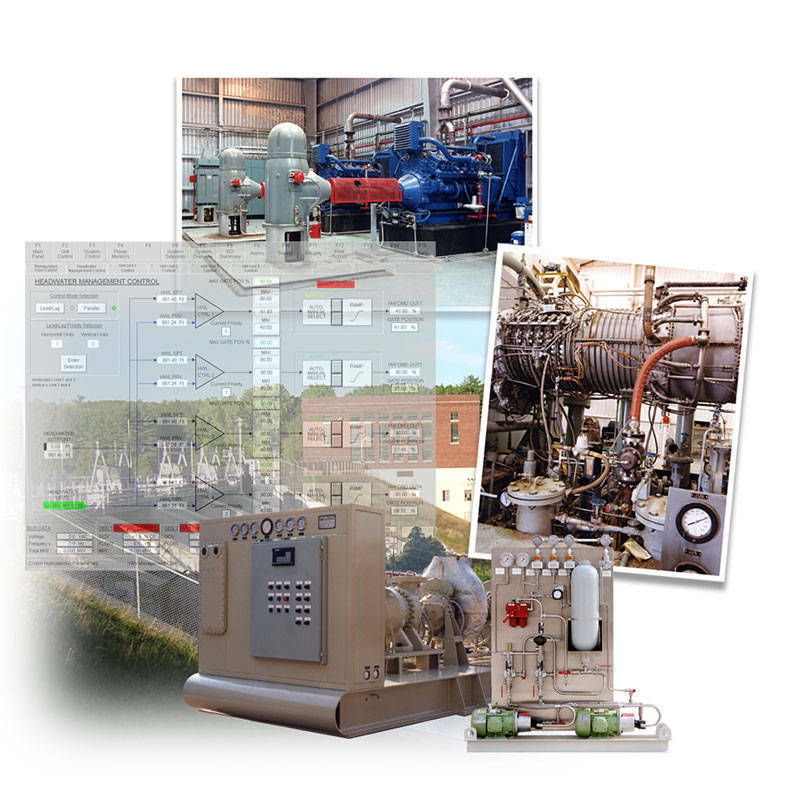 Our integrated control systems for gas & steam turbines include complete or partial control system retrofits for turbine driven packages for the oil & gas production, pipeline & gas processing, petrochemical & refining, power generation, and marine markets. Our applications provide custom monitoring and control of gas turbine fuel flow, turbine steam flow, firing temperature, bleed valve and variable geometry (VBV/IGV/VSV), and overspeed protection in an integrated, open hardware platform, and with a simplified interface to the DCS or SCADA. We can provide the solutions you need for gas, diesel, and crude fuel burning engine controls. Our reciprocating gas engine/compressor integrated control system can be installed as a complete or partial retrofit depending on your demands. We employ these applications in the oil & gas production, pipeline & gas processing, petrochemical & refining, power generation, and marine markets. The PLC-based system can include speed control (governor), torque control, air/fuel ratio control (including Trapped Equivalence Ratio – TER modeling), ignition timing setpoint generation, temperature controllers, capacity control, DCS/SCADA interface, and a graphic operator interface for system status, trending, and data logging. Our compressor anti-surge control systems adapt to rapidly changing pressures and flow rates, preventing surge and maintaining stability in your specific compressor/process application. Some of our advanced applications include Series/Parallel Loadshare Control, Compressor Performance Control, Multi-Stage Anti-Surge Control, among many more. Protect your machinery and optimize your compression systems by maximizing throughput and minimizing driver power with our Advanced Compressor Control Systems. We offer a full array of generator controls for customers in the oil & gas production, power generation, emergency/standby power, and marine markets. Our generator controls are integrated into a complete driver/generator control system, resulting in a lower cost of ownership while simplifying your operation. We offer complete Excitation System Upgrades for rotating and static exciters. Our applications include Automatic Voltage Regulators, Generator Protection Systems, and Automatic Synchronizers. Our pneumatic and electronic control systems for pumps feature engine and pump protection, automatic start functions, and monitoring and shutdown capabilities. We provide applications for multiphase pumps, waterflood pumps, water injection pumps, fire pumps, pipeline product pumps, and many more for use in the oil & gas production, pipeline & gas processing, petrochemical & refining, power generation, and marine markets. We offer complete hydro electric power plant control including turbine governor control, mechanical governor & hydraulic actuation upgrades, supervisory control with headwater level/run-of-river/re-regulation control, balance of plant control, autosynchronization, automatic voltage regulation, generator protection; and real & reactive power control. Custom control algorithms are provided for Pelton, Francis, and Kaplan hydro turbines with wicket gate and runner blade control. Reach out to us through our custom hydro control strategy form, and we'll get to work on designing your solution. We take safety very seriously, and we know you do, too. That's why our engineers consistently stay up to date on industry standards and requirements for hazardous area requirements, including flameproof, encapsulation, and pressurized hazardous area protection systems, among others. No matter what industry you operate in, we'll ensure your control systems are protected from dangerous events. For the petrochemical and refinery industry, we provide flexible decoking control systems with SIL1, 2, or 3 safety architectures in a simplex, redundant, or TMR format. Our control facilities can be fully automatic or manual and feature real-time equipment monitoring and advanced diagnostic algorithms. Our complete decoking control system packages consist of main unit control panels, local pump control panels, operator control desks, distribution boards, VSD cabinets, and operator cabins. Our decoking specialists can work with you to develop a custom strategy and install it on-site. We want to help you maximize the remaining life of your control systems. Our upgrades and auxiliary systems help you do just that. From PLC Controller upgrades for all legacy systems to replacing outdated auxiliary systems and components to interface with new controls, we can help your business stay up to date while helping you save on costs. You need process control systems that allow your employees to automate processes and maximize efficiency. From FCCU Air Blowers to Wet Gas Compressors, we can develop advanced control strategies that lead to lower operating and energy costs. Learn more about our process control systems. Our stand-alone products represent decades of extensive knowledge and expertise in providing our customers with smart, efficient solutions, with applications such as Anti-surge Compressor Controllers and Steam Turbine Controllers. These products can be combined with an existing control system for a low-cost solution. Flexibility is vital to our operations, and as such, we can design and develop special applications based on your needs. From complete control rooms and conveyor control systems to pigging control systems and valve sequencing systems, we can help you find a solution. At Petrotech, we want you to achieve the greatest efficiency output, safely. Our control system applications come from over 40 years of experience in the turbomachinery control market. We can work with your team to design a new installation or work around your existing installation, saving you costs and time. Explore our Literature Library for a full list of our specific applications.